One rampant side effect of our economic roller coaster is that hosting moving parties has become more common than throwing baby showers. With the housing market what it is, statistics show that far more people are moving than they were just three years ago. Most are moving into shared spaces to save on rent or dump an unmanageable mortgage. Those who are lucky to have landed a job must often accept that it requires relocation. And of course during the summer, college grads are returning home or moving on to the real world. 42 million Americans move each year, according to moving.com. That’s 15% of the population every year! 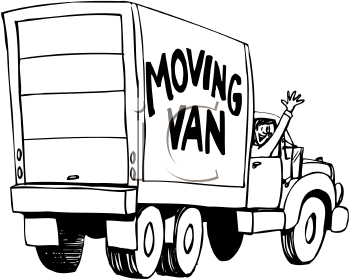 And, since the average person will move 11 times, it’s fairly likely that you are preparing for a move right now. Whether the move is to another state or across town, I am sympathetic. If you’ve ever moved, you know that the cost to move all of your beloved possessions from point A to B is quite high. 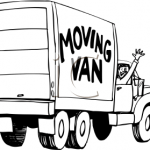 The most expensive factor in moving is quantity – which boils down to size and weight. The heavier and bulkier your load, the harder it hits you in the pocketbook. If you’re an optimist, you tell yourself this is a prime time to clean house. Simplify! Then as you start packing, you inevitably question how and why you have so much stuff. How did it all fit into the current space let alone the smaller spot you are headed for? This is why first rule of moving is to PREPARE to move. Literally take a few weeks to get organized in your head and in your house. When you wait, you end up tossing everything into boxes and taking twice as much you should. Planning will help you keep your stuff out of storage, allow you time to stock up on cheaper supplies, create a budget and ultimately lower the cost to move. Will you do it yourself or hire a mover? Will it cost less to ship your car or drive and pay for gas? Will you need a hotel? Need to eat out? What about cleaning, connecting utilities, overlapping bills at your new and old places, security deposits, parking permits, pet fees, new drivers licenses, groceries for the empty fridge, and pizza and beer for your helpers? Unanticipated expenses surprise every mover. Add 10 percent to your final budget for the unexpected. Check out Part 2 and Part 3 for more great tips to lower the cost to move! This entry was posted in Cash4Books News & Updates, Do It Yourself, Saving Money and tagged cheap move, de-clutter, decluttter, how to move, moving stories, moving tips, reducing moving expenses, save money moving, yard sale how to on August 24, 2011 by Jim McKenzie Smith. Founder and CEO of Cash4Books.net. I'm an entrepreneur. I love ideas, solving problems, and learning new technology. My personal "why" is to find a better way and share it with others. Follow me on Twitter: @pdxJimSmith. Find me on Linked In: linkedin.com/in/cash4books/.